Power Mac Center in the Philippines is currently holding their biggest anniversary sale ever where you can get up to 90% discount on some of the available accessories. I was lucky to be one of those to pre-register and visit their anniversary event where I was able to purchase a few items at a very good discount. But for this post, let me first cover the MiPow VoxTube 700 and what I think about it. MiPow VoxTube 700 is a wireless mono Bluetooth headset in a unique rectangle-tubing shape that comes in four colors – black, silver, purple, and red. It’s originally priced at Php 2,399.00 (USD56.99), but for this special event, they are selling it for only Php 600.00 (USD 14.25)! That’s a 75% reduction from the original price! Before I made my purchase, read some reviews online to make sure it’s still worth every penny. 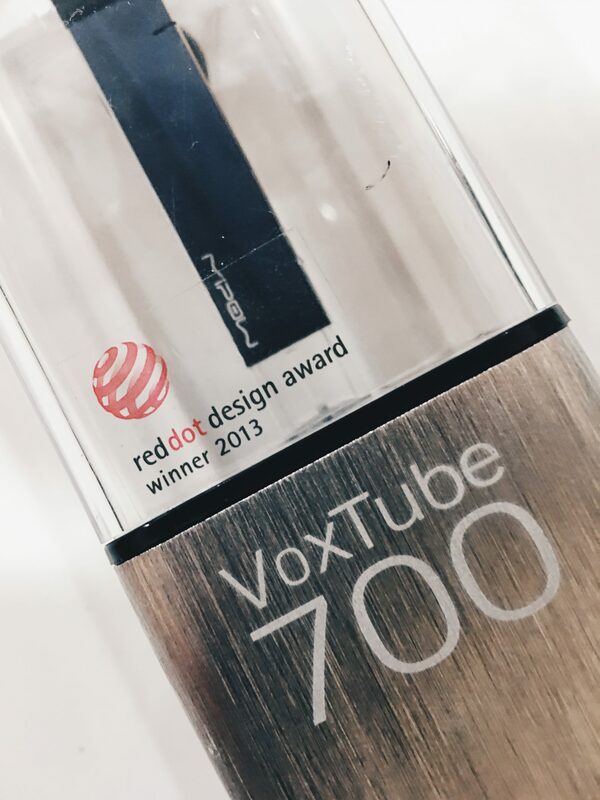 Yes, the device is a red dot design award winner in 2013, the year when the product was also launched. The first thing I’ve noticed, which really caught my eyes, is the packaging. It looks good, it makes you want to buy it right away. But how was it? Is it worth buying even if it’s on sale? Because honestly, not everything that’s considered a good deal is worth buying. The use of Bluetooth has expanded compared to when I still work as a tech writer for a wireless communication device company. Today, you can already use it to play music and be paired to up to two devices. Actually, one of the reasons I’ve decided to get one would be to have something to use when I go for a run. How the device would look like when wearing it. Made a phone call and connected it to my Spotify and I can guarantee the noise reduction promised in the packaging. It feels good to listen to music from just one ear and still make the other attentive of the environment. Surprisingly, the device is easy to charge. The light indicator will stop blinking once it’s fully charged (approximately 1 hour). MiPow VoxTube 700’s battery life can last up to four hours when listening to music. Rated it 5 of 5 because it stayed true to it’s promise in the packaging. But if I compare it to other devices available in the market, you can definitely find something that can last longer. It’s easy to wear and use but your earlobe would hurt after an hour of using it. But I think that’s very typical of in-ear devices as well. I have yet to find that device that will still be comfortable to use regardless of how long you use it. At its on-sale price of Php 600.00, I will say it’s a good deal. But at its original price? I may still have to think about it. The Power Mac Centre’s 22nd Anniversary Sale promo is the biggest sale they have conducted in the Philippines yet and will run until Sunday, 21st of August. The pre-registration link has been disabled already as of this writing, but you can register during your visit. Just make sure to bring a valid ID when you head to SM Megatrade Hall 3 of the SM Megamall.